The Bite of Seattle - Anyone Hungry? The Bite of Seattle - Wanna Eat? One of our favorite things to do is to try out the good food in a new place that we visit. 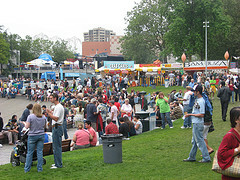 Well, Seattle's Bite of Seattle is a food lover's dream and is one of the coolest events to try out the famous fare in Seattle. The sumer three-day event (usually held in July) has a relatively long history and has continued to attract locals and tourists alike interested in eating good food while enjoying some great entertainment. The first Seattle event was actually held in 1982 at Green Lake (the same place where the Milk Carton Derby is held). The event began with the vision of Alan Silverman, who at that time was the president of Festivals, Inc. What was amazing about that food festival was that even though it was the very first one, twenty-five restaurants participated and there were over 75,000 people attending! Amazing! Well, since that date, the Bite has only been getting bigger and better. Now, the festival regularly gets over 500,000 visitors over the three days with 60+ restaurants offering tasty treats of all kinds. Eating, eating, and more eating, of course! Well, yeah, that's obvious. Eating is the main attraction of the festival, but in recent years the food tasting has gotten even better. Food is always going to be the main attraction, but what makes the party even better is the myriad of entertainment activities that go on during the three-day event. These activities include musical groups (playing on over six different stages) providing all sorts of different music. In addition to the music, there are also comedy events and wine tasting activities. So if you're going to be in Seattle the first part of July, be sure and head downtown for a chance at some great food and fun entertainment. Admission is free (you do have to pay for food, of course), and you'll get to experience some of what makes Seattle a great place to be. Back from The Bite of Seattle.